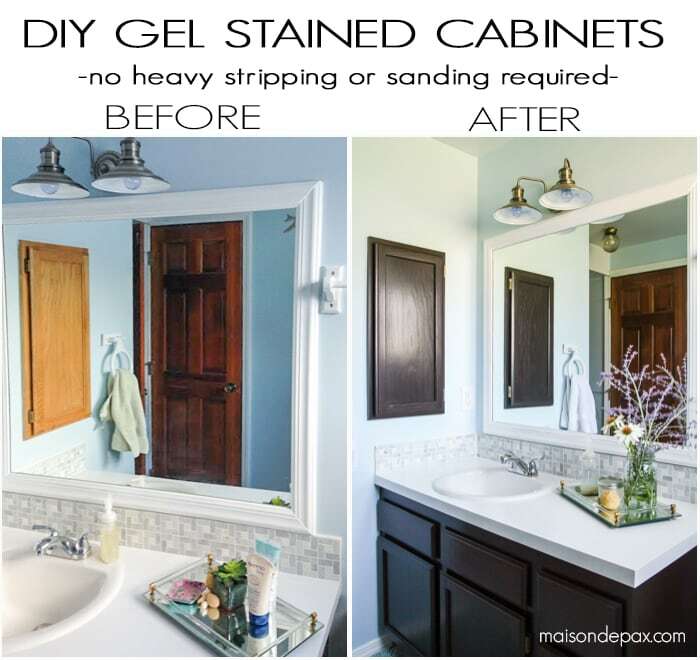 Breathe new life into tired, outdated cabinets with this step-by-step, affordable tutorial for updating cabinets with gel stain. 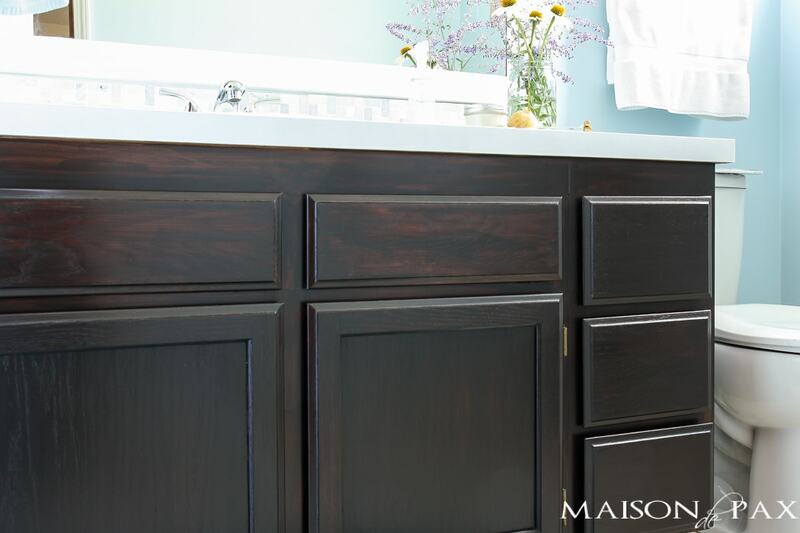 Keep the wood-grain look of stained cabinetry without the work of heavy sanding or stripping! Y’all. I’m SO excited today to introduce one of my oldest friends. Vanessa and I met on the first day of college when we were both just 17. Like me, she has three beautiful children (all incredibly close in age to mine! ), and she has been one of my greatest companions through this blog. 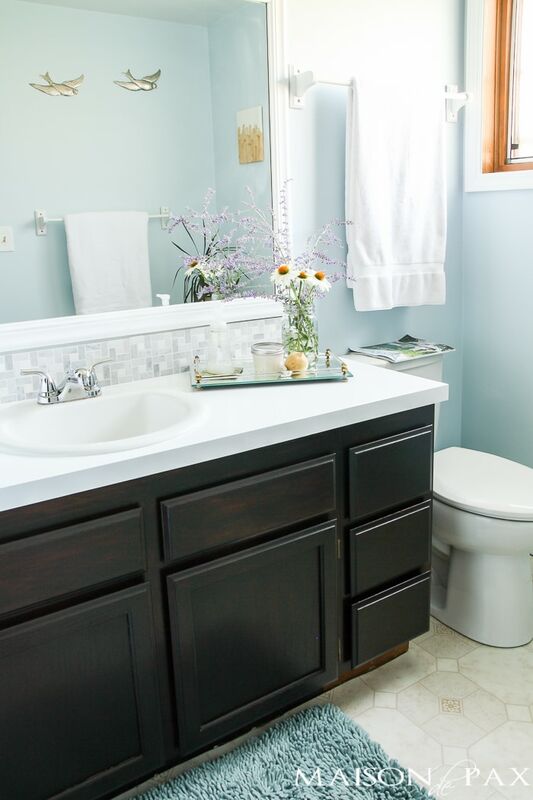 She has encouraged me, supported me, and talked “design” with me for hours and hours… When I saw how she transformed the look of her bathroom recently, I asked if she would be so kind as to share the project with you. Hello! 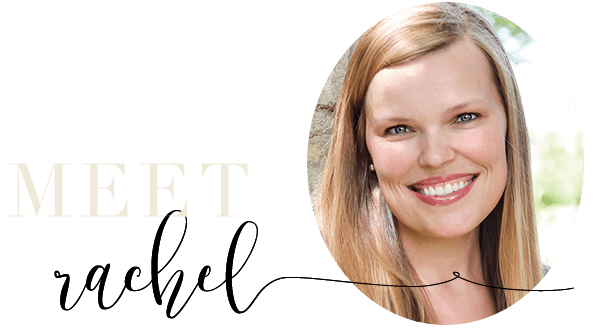 Thanks so much for the introduction, Rachel! Our family leads a busy and rich life, and, like most of you, time and finances are tight. My goal is to take on small projects on a tight budget with a big impact! My home was built in the 60s—a good era for hardy construction, but also dingy, orange palettes. The last piece to this thrifty update was the cabinets. The orange oak had to go. I considered painting my cabinets like my kitchen and upper bath, but stained cabinets bring warmth and rich design to a room. I also believe that staining surfaces is more durable than paint, but the prep and cleanup can be messy. Most stains require removing the original finish and a lot of sanding/dust. Gel stain provides the durability ֹof stain, but the application of paint. 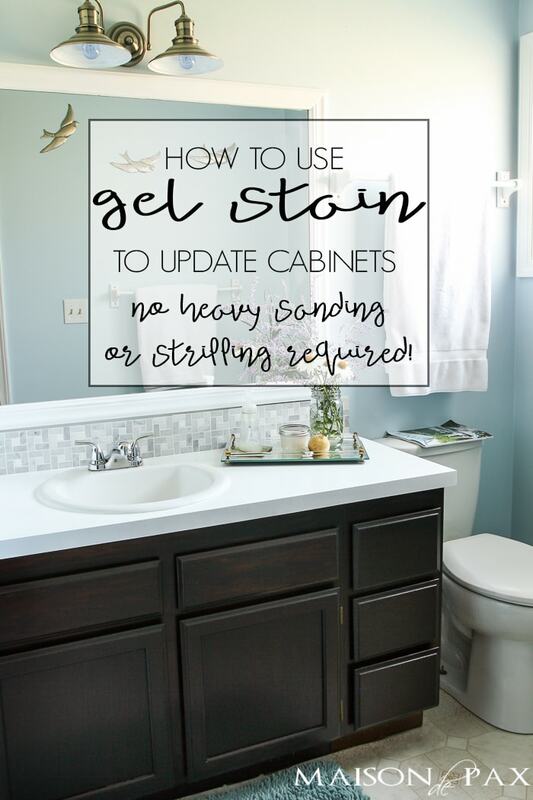 Staining cabinets isn’t difficult, but I did choose to wait until I could safely use oil products after the pregnancy of my last baby. You want to be cautious—use eyewear, wear a respirator mask, use gloves and open the windows for ventilation. The result, though, is totally worth it. I decided to use General Finishes Java Gel stain for this project. I used this product on my dining table and three years later, with heavy use, it has held up almost perfectly. The can of stain is still easily one-thirds full after 2 projects, so it is an economical option for multiple projects (#budget!). It also meant I didn’t have to strip the original finish off my cabinets. 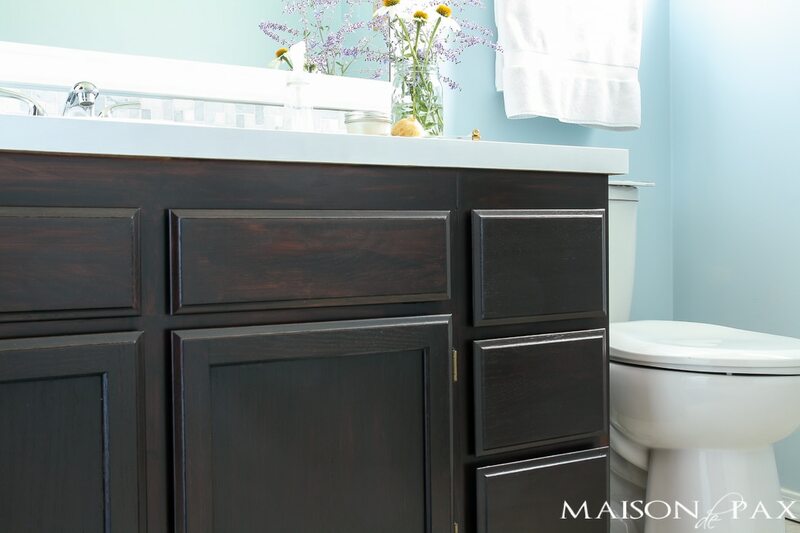 If you take the appropriate steps to prep your cabinets, you will have a durable, beautiful finish. Remove cabinets and hinges with screwdriver and clean hinges with dish soap diluted in water. Set hinges aside. Scrub/clean all cabinet surfaces and allow to dry. Be sure to remove all residue (old toothpaste is persistent). I noticed a few spots where the stain didn’t adhere and had to re-clean and stain again. Sand all surfaces with the sanding block. Use the beveled edge to get inside cabinet lips and facets. Your goal is to lightly scuff the surface, NOT remove the finish. Wipe dust away with a damp cloth. Allow cabinets to dry in dust-free environment. Using painter’s tape (I prefer Frogtape), tape off wall and floor surfaces where you do not want stain. Drape drop cloths to prevent drips from staining your floors. Note: This is the same process for prepping cabinets to paint. You would then follow with 2 coats of primer prior to paint. Wearing the gloves, gently stir the gel stain. Beginning with the backside of the cabinet, coat each cabinet lightly with the gel stain using an old cloth or foam brush. It will appear streaky; that’s ok. Don’t apply too thickly. Do not remove the stain (treat it like a paint). Wait 24 hours to recoat (tip: store your cloth or brush in a storage bag so you can use it again). After 24 hours, gently flip the cabinets over to the front side. After 24 hours, repeat with second coat on the front of cabinets (note: you might want to apply three, but two was perfect for me). Allow to dry. Wait 48 hours to apply the top coat. Gently stir the top coat and be careful not to introduce bubbles to the solution. Using a clean cloth, wipe light coats in quick strokes on the cabinets, waiting eight hours in between coats. Two coats should be sufficient. After 24 hours, check to make sure the topcoat is dry. If it is still tacky, wait another day. Reassemble the cabinets when thoroughly dry (tip: If you have a lot of cabinets and drawers, it doesn’t hurt to label which ones go where with some masking tape or a light pencil mark). Step back and enjoy the results! 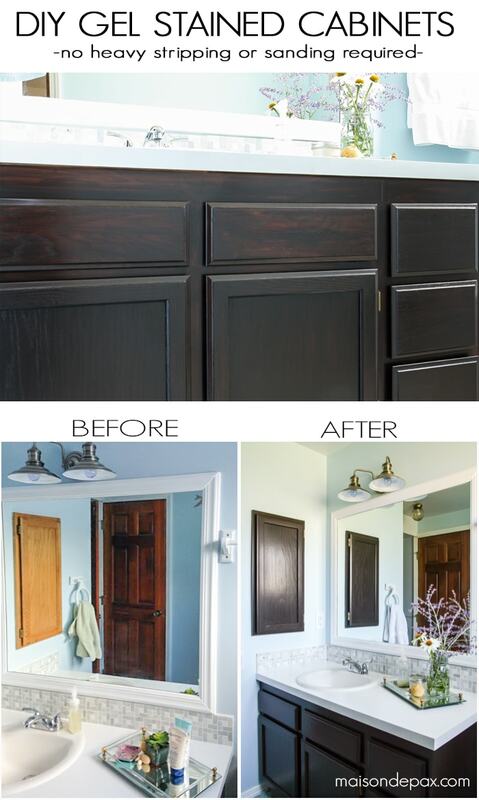 With this tutorial, I believe you can achieve a great finish and breathe new life into old cabinets. 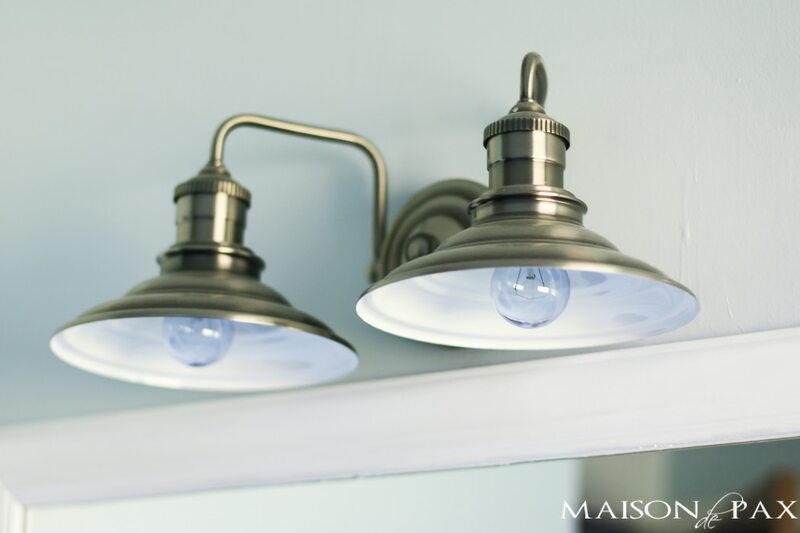 With patience and planning, you can take small steps towards transforming your space with a modest budget. Wow! It looks great!! Thanks for the tutorial. I may have to try this in my bathroom. I wish I could find the General Finishes. THey look so nice. I get mine on Amazon! Thanks so much Sarah! It feels so much brighter and I prefer it to my master bathroom. That looks great! 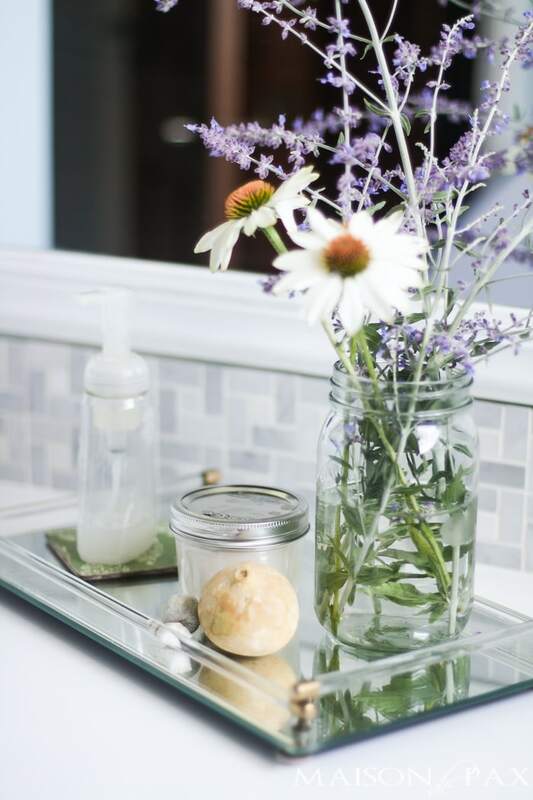 The whole bathroom feels fresh and clean, but personalized. Love it. Thanks Sara! I like bathrooms to feel open and airy, too. Such a great post! I can’t believe how much of a difference coloring the cabinets made. Love the blog, keep up the good work! Thanks Bailey! It definitely is a big transformation! Will the gel work on laminate/ particle board cabinets? Yes! The sides of my cabinets are laminate- and it worked beautifully. Prep is key! Many times in bathroom cabinets the side by the toilet isn’t real wood. It’s more of a veneer. Did you run into that with your project? Can the gel stain be applied to that as well? YES! It is veneer on the side of the cabinet and the base. I treated it exactly the same (obviously it doesn’t sand like the wood doors) and took the stain beautifully. What type of primer did you use before painting? You said to apply 2coats of primer before painting. Thank you! Can’t wait to do this! Hi! I mentioned primer if you were planning on using latex paint, but for the gel stain, you don’t need primer. You just need to make sure you clean, sand, and degloss! Hope that is helpful! Hi Patty! I used this one found on Amazon (affiliate link): http://amzn.to/2oDH4aU Hope that helps! How much did you buy? Gallons or quarts of the stain and topcoat? Can you tell I am getting ready to purchase? So excited! I just bought the small quarts for both the stain and topcoat. A little goes a long way! I used it on another big project and still have some leftover. Good luck! I love your transformation! I, too, have an older home and would love to so know the color of the paint you chose to paint your walls! It’s so serene! Would you consider emailing me!?! Thank you so much! I wonder if you could do the same with a wood floor? The gel technique probably wouldn’t be the best choice for floors since they get so much traffic. It is much more like a surface paint than penetrating the wood! Hope that helps. Wow it looks amazing. I will be using your tips this week as I tackle my kitchen cabinets. I did paint the countertop! There isn’t a tutorial, but basically here is what I did. I cleaned it really well, and then sanded with hand sander. Clean, clean, clean. And then I primed with three coats of Bullseye 123, allowing it to dry in between. I then used Behr Satin paint in the standard white- probably two coats. Later I applied multiple coats of polyacrylic (oil base can yellow) in satin to get a hard finish. I then let it cure while we were on vacation to get a hard finish. It is holding up really well! A great multiple year solution for what was an ugly yellow finish. This is amazing! I’m about to do something similar with our guest bathroom, and your instructions are so nice and clear that I think it will be a fairly easy project! I have a question about the countertop. Did you actually just use paint on the countertop? I didn’t actually know you could do that. Thanks! How do you think the Java gel stain would do on plain white cabinets? Do you think it would need more coats? Also on the Carrera border- does it come as a border and you just have to put it up or what? How easy/hard is that? Thanks. I have seen tutorials using it on white, but you’ll definitely need more coats. The marble tile comes like that- just adhere to the wall. Hello, I wanna apply this tutorial to staining my son’s crib.is that possible? The sub heading for this article says “no sanding”, yet you mention needing a sanding sponge and sanding. Why is that? The whole reason I wanted to use this gel stain is so I wouldn’t have to stain. I just need a few tips. Thanks to any help you can provide. 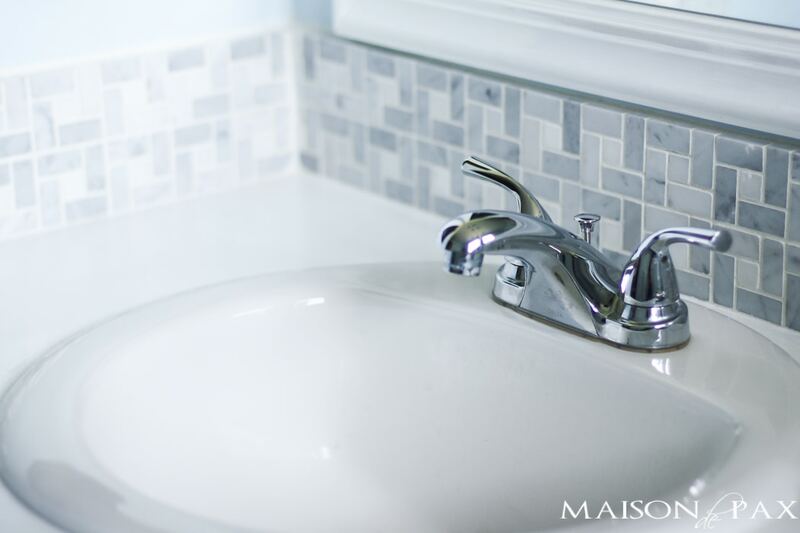 Your bathroom looks more modern and fresh. I love it! Hi Sherese! I’m not sure I would use this on a crib because it is oil based and maybe not the safest choice for a crib. But, the sanding reference just means a light scruff of the wood material. Traditional stain requires a lot of sanding, requiring you to move the previous stained wood. Do you know of any gel stains that are not oil based that I could use? There are lots of options- but I don’t know how well they perform, because I haven’t ever used them! Sorry I can’t help more. Thanks Rachel. Is there a gel stain that isn’t oil based that you would recommend for a crib? I did my bathroom cabinets in black! But I found a few areas were the stain didn’t take! How do I clean that area without ruining the rest of the. Area? It’s been 24 hrs. And it’s still tacky ! Once its dried can I soft sand it? I would gently wipe it up, sand and prep that area to make sure that there is no residue preventing it from adhering. I’d be tempted to though to wait for the other parts to dry so that you don’t change the finish on the other parts. Sometimes you need to wait longer to dry too. Hello I would like to know what stain color was used to stain the cabinets? Hi! Vanessa used Java in the General Finishes gel stain. Hi! Do you know how many coats of the stain you used? You mention it will look streaky during the first coat. Does that even out during the drying process, or did it take more coats? Thanks! I believe she did 3. If you have darker cabinets, then it will take less. If it looks streaky, it will require more coats– like paint! Hope that helps. I love the hammered look of the knobs in the gray bathroom. Where did you purchase them? Thanks for the great tips. We did our first coat of gel stain on Saturday. We followed the instructions to a T and used the same brand stain. All of it is dry except for a few spots here and there on the top lip of the drawer. So I’m assuming by now it should have dried like everything else did. Do you have thoughts or suggestions on what we should do with this? I’m wondering if it didn’t adhere in those few spots? Because everything else dried correctly. Hi. I noticed in the “after” picture of the bathroom vanity that it looks like the gel stain didn’t completely cover the wood underneath. It looks streaked and the light wood color is apparent. Is that how the entire finished project looks? Hi! I contacted my friend! She preferred the wood grain to show slightly through, otherwise she would have used a solid paint for a solid look. She doesn’t believe it looks streaky at all, but if you prefer even less natural wood showing through, then you could apply another coat! Some of that warmer color in the picture is due to light reflecting off that area too.